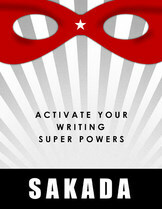 “With humor and insight, Sakada’s innovative Write Your Book program demys-tifies the process of book writing without dumbing it down. The result is a pro- cess that will be of immense value to beginning and experienced writers alike. The Visionary Author Program is a program that will help you, the committed entrepreneur, write excellent books that will leap tall buildings with your inspired message and awesomize the world, while bringing clients and multiple streams of income to your business. The program is about moving you from being an expert to being a visionary author and leader, and taking your business to the next level. Oh yes! I know I am throwing around that "Visionary" word and sometimes people do this to market to your ego. I am doing it because I really do see this as a call to action and I really think that we all need to step up and into our visionary selves. It is in each and every one of us to be a visionary in some way. Let's look at the definition of visionary: "A person with original ideas about what the future will or could be like." Now break yourself open so that you can see your visionary-ness! We know that you want to contribute, to be part of the good change in the world, to matter, to leave your mark... but sometimes you are not sure what your genius is, how to articulate it, and/or how to take it out into the world in a way that makes sense. Or you know your expertise, and you want to take it to the next level, where you truly own it! You want to go from a business pitch to a vision. You want to move into a higher gear that takes you well beyond where you have ever been. You are ready to step into your full vision! Stand up in the world in a whole new and enlarged way! Writing a book will truly rock you, your world, and the world! It is time for you to rise up to it. Replace the image of you struggling to write a book alone with the picture of you and your Write Your Book coach at your book launch party - Oh Yes! "I have a very creative and active mind, which meant that framing my book topic was often like herding cats. The Write Your Book process allowed me to take all of my ideas and crystallize them into the clarity and focus that a good book requires. As a coach, Sakada kept me in line every time I wanted to wander from my topic, and instead encouraged me to go deep and discover new ideas and ways to communicate. The process has been extremely empowering to me. I have also experienced a new level of confidence in what I have to share with the world. With The Chemisty Factor, I created a process that speaks with my voice. I have a big message that is authentic to me, and a process that is specific and unique. I love how all my ideas came together! Sakada shares her love and support as well as a spot-on discipline to keep you on your path. And when you work with her, she will stand with you in your commitment to your vision. If you have something you want to share with the world – a message, a process, a story, or an idea – I urge you to embrace all of the things that The Visionary Author program offers."